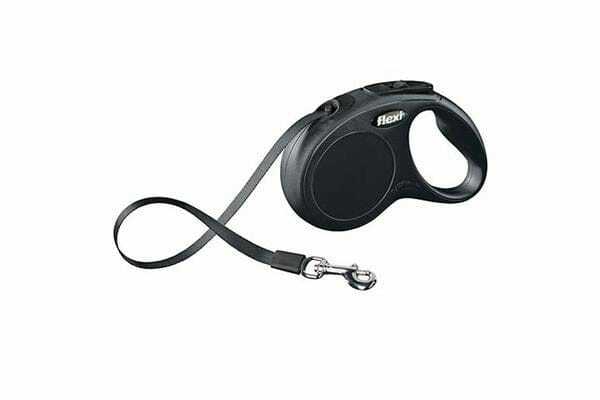 Retractable tape belt dog leash. Reflective components for added visibility and safety. Made in Germany with the highest of manufacturing standards and quality. Black matte finish gives the case a stylish design while also maintaining durability. The tape is a black nylon belt leash. Easily attaches to the collar or harness D ring. Easy lock and release allows user to easily stop, extend or retract the lead for precision control. Lightweight handle and ergonomic grip for comfortable one-handed operation. Also available in red here. X Small:, Max 3m lead. Suitable for dogs up to 12kg. Small: Max 5m lead. Suitable for dogs up to 15kg. Medium:, Max 5m lead. Suitable for dogs up to 25kg. Large:, Max 5m lead. Suitable for dogs up to 50kg. Check out this video to see more about Flexi’s retractable dog leads. Flexi has been the leading company when it comes to world quality retractable leashes. Millions of happy dog owners around the globe use this unique innovation from Germany, the Flexi retractable dog leash. As the inventor of the Flexi retractable leash, their creative vision has set the global standard. Flexi have established themselves since 1973 as the market leader in nearly 90 countries. This German designer has been a worldwide best seller for years providing high quality well designed products known for their durability and lightweight design. Looking for a new collar to go with the new lead? The latest Loomo Moonshine LED Dog Collars are available in, blue,, green, and, red!